Hopwood-based artist Paula Hamilton finds art within a nearby landmark. One of the great advantages of living right in the centre of the UK is that we are so well situated to visit many wonderful places. Being stuck in a relatively remote “end point” of the British Isles like Scarborough, St Ives, St David’s or Stranraer would, perhaps, feel more cut off, less easy to be reached and further away from the centre of things – not that I have anything against places beginning with S! I suppose what I mean is that I’ve become a fan of living in the centre. We notice this particularly when visitors come to stay; to have on offer, and within easy access, such places as Kenilworth Castle, the Black Country Museum, Avoncroft Museum & Arts Centre, Birmingham Jewellery Quarter, Midlands Arts Centre – OK, this list is getting long and boring, but we should celebrate the cultural richness of our patch. On a recent visit to Worcester Cathedral, only half an hour’s drive away so definitely “do-able”, we were knocked out by its beauty; how can we have lived here for so many years and not have discovered it? The awesome scale of the cathedral, its magnificent cloisters, the delightful setting in the centre of town on the bank of the river Severn, made this a really worthwhile outing. What is interesting about our times is that, just as a library is no longer just about borrowing books, so a cathedral is no longer just about worship. Diversification means that cathedrals become coffee shops, gift shops, exhibition spaces and much more. This brings me to Birmingham Watercolour Society, who have an Art Exhibition in Worcester Cathedral this month entitled Life’s Journey and running from October 7 to 19. Birmingham Watercolour Society has an interesting history: It was formed in 1907 by 14 keen artists who shared a great love of painting, and faith in watercolour painting in particular, as a vehicle for self expression. It was a man named Walter Showell, writing under the pseudonym Vandyke Brown, who responded to a letter in a local newspaper which bemoaned the lack of a dedicated watercolour society and arranged the first meeting of BWS and became its first President. The Society has managed to stay true to its ideals and has continued to meet regularly up to the present day, even through both World Wars. One letter of apology from a member received by the then Secretary during WWII stated: “I have been inconvenienced by one of Mr Hitler’s followers, but intend to be along later”! Today the Society meets monthly, at St George’s Community Hub in Newtown, in the centre of Birmingham, with occasional visiting speakers. Society members are encouraged to bring along their “work in progress” to meetings, to allow observation, discussion and comment on each fledgling painting. This takes place in a positive and constructive atmosphere and means that members learn directly from one another, share ideas, explain techniques and understand something of the driving force behind each artist’s make-up. Today there are approximately 85 members in the Society; artists from all over the UK, as well as from overseas, are welcomed although the majority of members live in Birmingham and the West Midlands. Only those artists demonstrating exceptional skill are admitted as members to BWS and this is done by election – the applicant has to present six framed pictures to the Committee which then decides, in a private vote, who is elected. This process, although a little daunting for some applicants, helps to keep standards and quality at a high level and ensures exhibitions are well received. The Society usually holds three exhibitions each year in the spring, summer and autumn. This year’s exhibitions have been held at the Royal Birmingham Society of Artists (RBSA) in the spring, at Hanbury Hall near Droitwich in the summer; and now, this October, in the Dean’s Chapel at Worcester Cathedral. 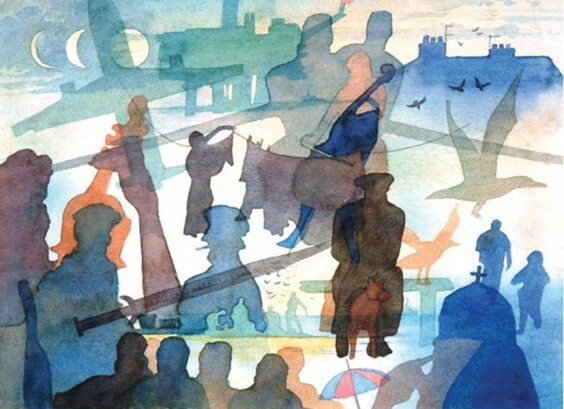 The BWS has a great website which not only spreads the message about watercolour art, but also promotes and showcases the work of their artists and gives up to date information on exhibitions and events.